For lunch we finished the Eggplant Massaman Curry from Monday night, with a little added peanut butter, which improved the flavor. Lunch today was $3.86 per serve. Tonight was the postponed LACPUG meeting, followed by pizza. Each person contributes $5 so that’s the cost per serve tonight. Two dishes split between us $6.74 per serve. 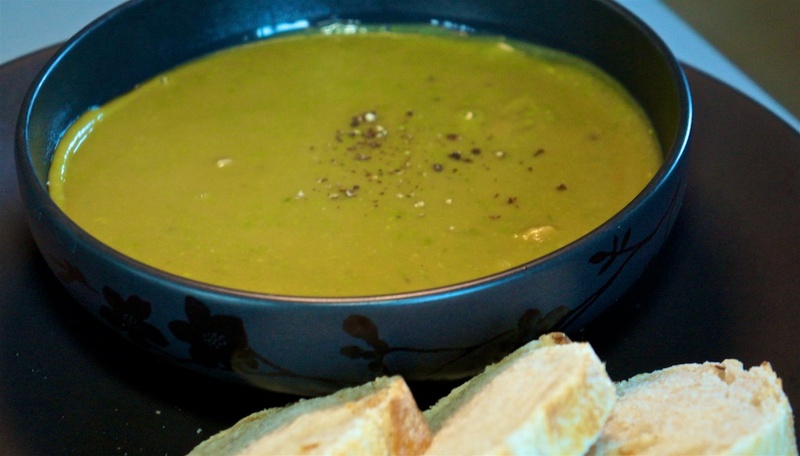 One of the great joys of baking a ham is to make ham stock, and then pea and ham soup. The ham bone is pressure cooked with water and three bay leaves. The cost of the bone is probably $2.00 because its weight was included in the total cost of the ham, but not in the calculations of meat usage. We split the stock into two batches. One was frozen, the other used immediately. 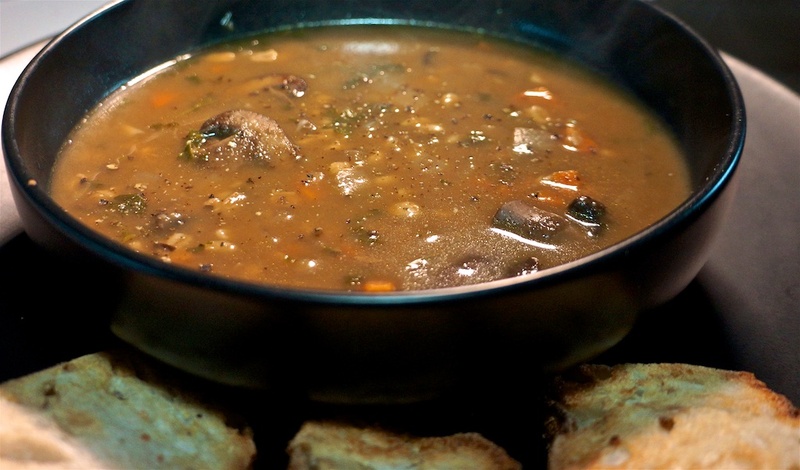 The soup is simply prepared by adding split peas to the stock and pressure cooking again. Our innovation is to blend in one pound of fresh (frozen) peas at the end. It lifts the texture and provides a bright note to the flavor. The soup recipe makes six serves. We cubed some left over ham and put it in the bowl, poured soup on top and served with fresh baked bread. 1/4 of a loaf of par baked bread is 63c. For dinner tonight the soup cost 60c per serve. With ham and bread $1.73. The bread was more expensive than the soup! Burbank Monday so foodie Philip had the regular In and Out Double Double (animal style). With the arrival of some massaman curry paste it was time to try a massaman curry. 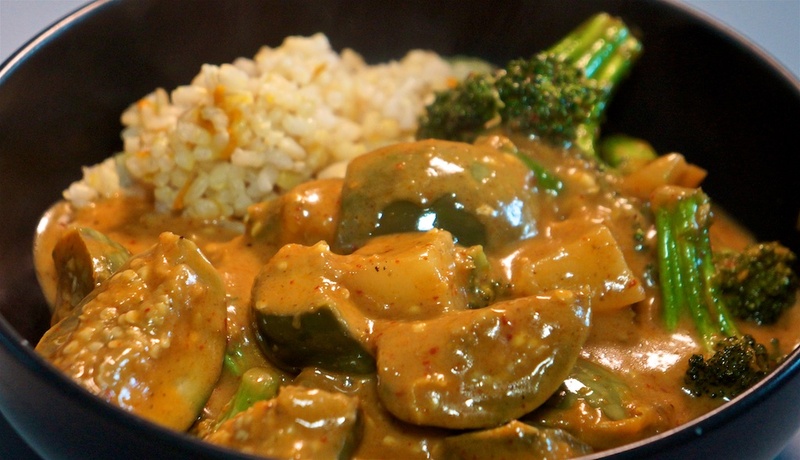 A simple recipe with potato, Thai eggplant and broccoli, we were underwhelmed with the result. We’ll try again tomorrow night with the addition of some peanut butter to bring the peanut flavor associated with massaman. Thai eggplant is a small, round eggplant that looks more like a miniature water melon than a typical eggplant. We aren’t fans of basil so that was left out of the recipe. It also turns out -with some research – that it is more usual to add salt than fish sauce to a massaman curry. Dinner tonight cost $3.36 a serve and, while it was quite tasty, we’ll do better. Being a weekend lunch with time to prepare, foodie Greg decided on slow cooked scrambled eggs, with wild caught smoked salmon and a smear of cream cheese. Slow cooking the scrambled eggs – with not dairy or water added – creates an entirely different experience. Eggs are creamy, and taste of yolk. It’s almost like the barely cooked yolk was held in suspension by the set whites. It took about half an hour to slowly bring the eggs to temperature. Add 20c for the smear of cream cheese. Today’s gourmet lunch cost $4.70 for a meal that would be well over $20 in a restaurant. Time to use up some leftover ham! 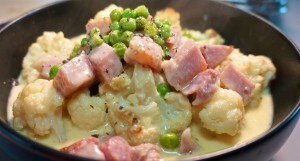 A simple dish of roasted cauliflower florets, with cubed ham and cheese sauce. The cheese sauce is interesting because it is simply water, sodium citrate and cheese. No white sauce involved. The sodium citrate (available from Amazon) allows the cheese to be blended into the water without breaking. 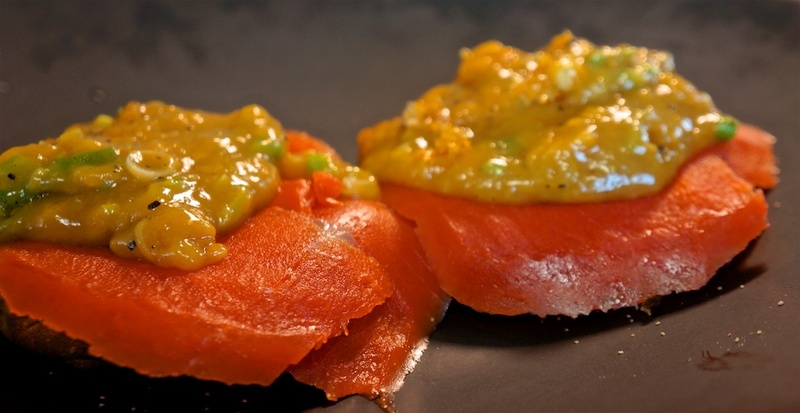 The cheese sauce is richer and more ‘cheesy’ than one made with a roux. Roast cauliflower, ham and cheese. The organic cauliflower was $3.22 or $1.61 per serve. Dinner tonight hit all the right notes and cost $6.11 per serve. For lunch today we did a repeat of the March 8th lunch with Wildbrine Fermented Madras Curry & Cauliflower Sauerkraut substituting for the pickle. Interestingly, the flavor profile of the Wildbrine product is very similar to an English Piccalilli pickle. The sauerkraut was $6.99 for 18 oz or 88c per serve. At Christmas and Easter most of the major supermarket chains have a loss-leader ham, which we duly purchased for 99c per lb. A generous 11 lbs we will be eating ham-based leftovers for a while! Tonight we paired it with Choucroute Garnie, although in a very non-traditional variation, Greg left out sausage and any pork product. We figured the ham would be enough pork! We prepared a smaller batch with four serves. The technique we used was to bring the ham to 130ºF before removing the skin, basting and returning to a hot oven to finish at 140ºF. We served with a dressing foodie Philip came up with: a combination of pomegranate molasses, dijon mustard and horseradish. 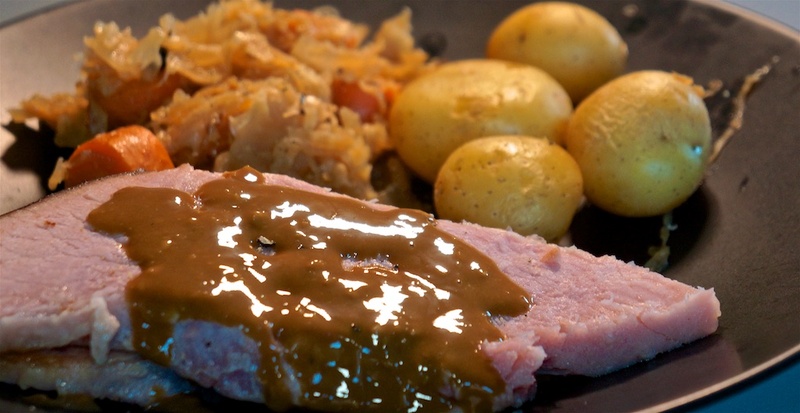 It has a perfect balance of earthiness, sweet, tart, savory and a little hot from the mustard. Dinner tonight was $2.62 per serve. For lunch we went back to a staple: avocado and sardines on an English Muffin. Trust me it tastes much better than it sounds. We chose Trader Joe’s Sardines in Harissa sauce for even more flavor. Trader Joe’s Sardines in Harissa retails for $1.29 per can, or 65c per serve. Lunch today cost $1.65 per serve. Editor’s Lounge was at Key Code Media so food was supplied by Alpha Dogs so foodie Philip ate for free. At home Greg had a noodle soup from Whole Foods for $1.99. One of the strongest recollections of my childhood years was the appearance of Hot Cross Buns – a sweet, spiced fruit roll – around Easter Time. I got word from Facebook that Whole Foods had some and we dutifully purchased, toasted and enjoyed two each for lunch. Neufchâtel cream cheese makes a fine alternative to butter and is $1.99 a block, or 33c per serve. Our nostalgic lunch today cost $2.10 a serve. Nostalgia comes at a price. Having moved from the convenience of Avalon’s outdoor grill, we avoided any grilling until today. The cast iron griddle on the induction cooker makes a fine substitute, as long as you have great ventilation for the inevitable smoke. 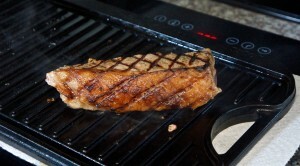 The induction cooktop had the griddle too hot for me to hold my hand on, in 14 seconds! Great for cooking steak. 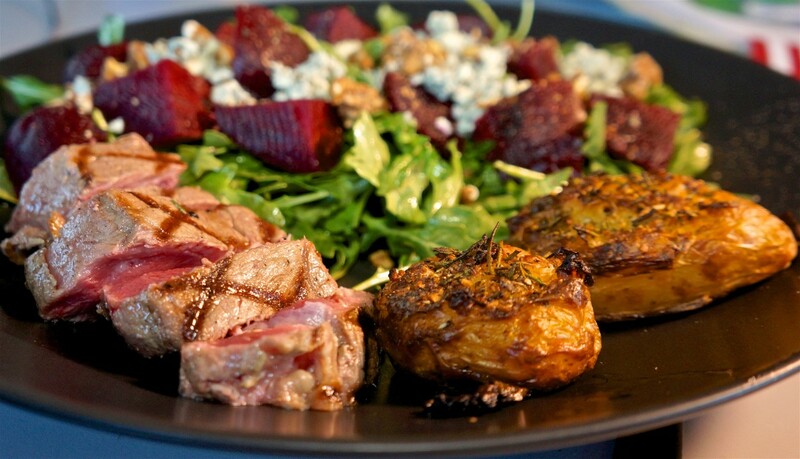 We served with Crash Hot Potatoes and a simple salad of Arugula, cooked beets and blue cheese crumbles. This is another meal with great flavor and is easy enough to cook that you could enjoy a date night, (apart from that smoke issue but cooking outside would solve that). Tonight’s dinner, worthy of a steak house night out, was $12.20 per serve, which compares very favorably with the $45-50 it would cost with tax and tip. You’ll note that we like our steak rare. At first I thought this was underdone because of the new setup, but because the meat is of such high quality, and there’s little fat served, that the rare parts were much more tender than the cooked area around the outside. We wonder if we’ve been overcooking New York Strip in the past. Because of the new location we haven’t had supermarket sushi for lunch for a while. The supermarket a little further away has a sushi counter. It’s a different provider and is somewhat more expensive than in Burbank – Porter Ranch is a bit tony – but probably has slightly better flavor, so it balances. Lunch today cost $9.50 per serve, somewhat more than the $6.39 average from the Burbank store. In fairness this was a double tuna serve, whereas from Burbank we had one vegetarian roll and one with protein. Thank goodness for leftovers. We had been expecting to go out for the LACPUG meeting but discovered at the last minute it was postponed until next week. We had two serves of last night’s stir fry left, so that’s what we had. With a little extra chilly sauce to ramp up the flavor, dinner tonight was $3.65 per serve. Today was a recording of Lunch with Philip and Greg so we were in Pasadena at a small-chain pan-asian restaurant, although we had planned on the Vegan restaurant next door, but Tuesday is their day of rest. With tax and tip our average was $14.25. For dinner tonight we looked in the freeze and found some ground pork from our Prather Ranch mostly delivery. 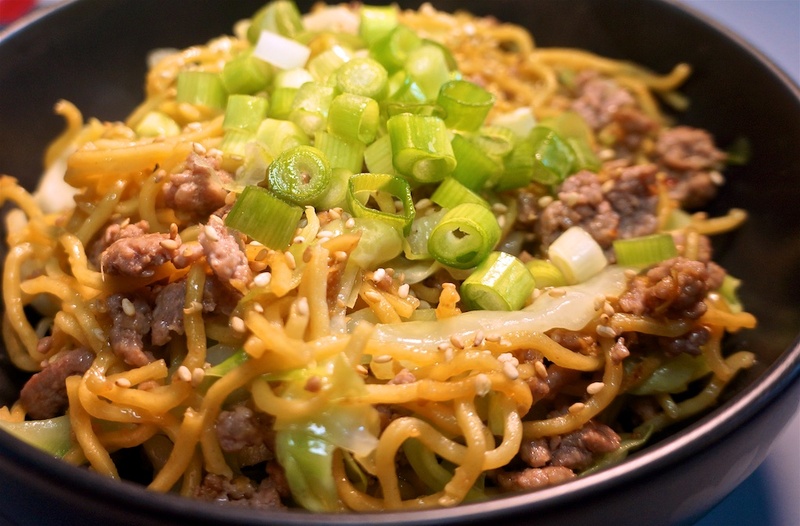 With that start in mind, we cooked Stir Fried Shanghai Noodles with Ground Pork and Napa Cabbage. The recipe makes four generous serves. It was a fine meal. Even though we ramped up the ginger, we could have gone even further. We still had half a regular cabbage from our Corned Beef and Cabbage dinner, so we used that instead of a napa cabbage. The cabbage adds 21c per serve. Tonight’s dinner, which probably needs the flavor ramping up with a little more ginger, cost $3.61 a serve. It was an interesting experiment in featuring the organic, direct-from-farm ground pork in a recipe that didn’t drown any experience of the pork flavor. Being Monday it was Burbank day for foodie Philip, which means an In and Out Double Double Animal Style. Meanwhile foodie Greg had an onion bagel with cream cheese. The onion bagel is 33c and the cream cheese adds 42c or 75c. Averaging the two lunch cost $2.39 per serve. For dinner we revisited the Mushroom Barley Soup we had left over from March 11th. As it did then, with bread it cost $3.01 per serve.